Everyone knows that EDM (Electronic Dance Music) culture is more about the style than the actual music. Entire apparel companies exist purely to outfit you for your next EDM festival, and you really need to bring your A-game if you want to stand out in the crowd. The best way to do that is to create your own fashion statement, and Redditor l30 built an LED half mask that definitely accomplishes that. This mask started as an airsoft half mask that just covers the nose, mouth, and cheeks. The bulk of the mask is constructed from metal mesh that protects the wearer from airsoft BBs, but doesn’t restrict airflow. It’s also perfect for allowing light from LEDs to shine through. Those are NeoPixel-style WS2812B individually-addressable RGB LEDs, and are controlled by an Adafruit Gemma M0 development board that is intended specifically for wearables projects. l30 used a total of 53 LEDs, which are arranged to fit the shape of the mask. A thin piece of flexible white plastic was sandwiched between the LEDs and the metal mesh to diffuse the light. Then, the LEDs and the Gemma M0 were covered in a layer of black fabric to protect them and ensure that the mask is comfortable to wear. Finally, three AAA batteries are housed in a battery holder on the strap, and two buttons on the sides of the mask are used to set the brightness and change lighting patterns. The finished mask looks great, and will definitely stand out at an EDM dance party. 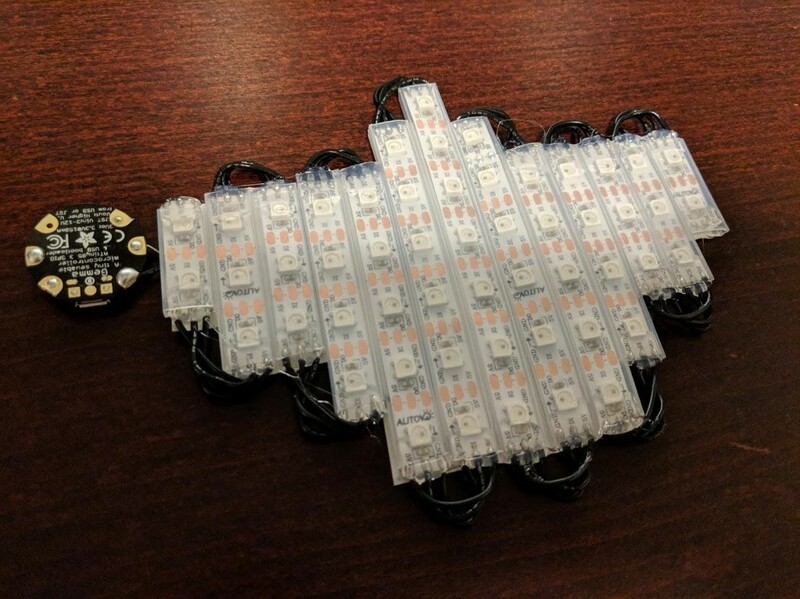 This LED Half Mask Was Built with an Adafruit Gemma M0 was originally published in Hackster Blog on Medium, where people are continuing the conversation by highlighting and responding to this story.